So yesterday like many others I decided to watch the live-stream of the Burberry show, and what can I say, it was amazing, I loved every bit of it. I did take some screen shots when it was on to show on here but the quality of them was really bad because of the movement so instead I took these pictures from the Burberry website. There is literally so much I would buy if I could afford it. I loved all the cute bows cinching in the waists, definitely gonna have to try a DIY version of that myself. I loved all the fabrics used as well like the corduroys and tweeds, it seemed so english countryside chic. The finale was absolutely amazing, the rain over the glass roof was such a cute quirky idea that worked with the collection and made their show stand out, and then the models coming out with umbrellas as fake snow began to fall was just beautiful. 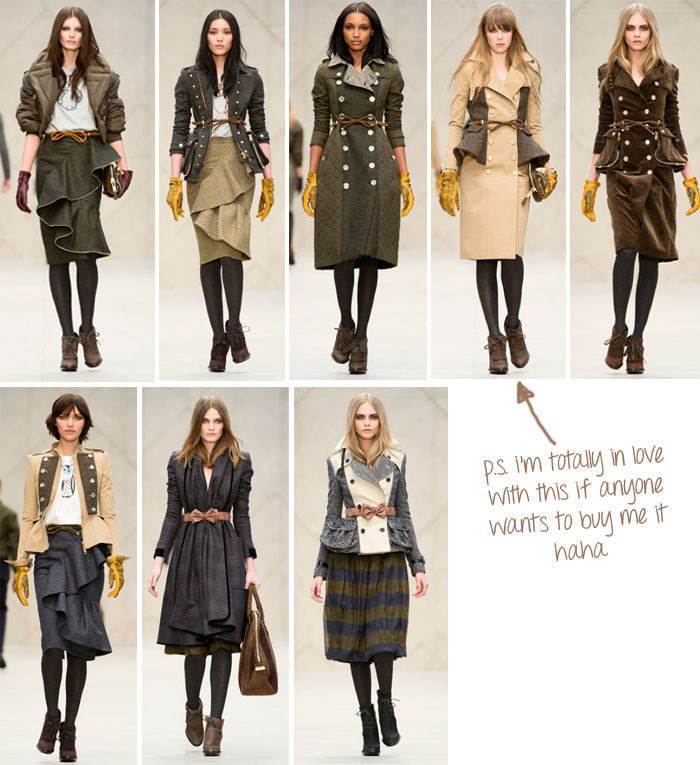 I <3 Burberry, cannot wait for next season!